Touro Synagogue, the oldest synagogue in America, is located just minutes away from our Newport Inn. Newport’s first Jewish residents made their way to the island in 1658 from Barbados. Upon the arrival of these fifteen families, a new congregation was formed. They called themselves the “Yeshuat Isreal.” By 1677, the congregation realized they needed to acquire land for a Jewish cemetery and Mordechai Campanal and Moses Israel Paeheco, two of the original immigrants, purchased a lot on the corner of what is now Kay and Touro Streets. The Jewish population had grown by 1758, to a point where they needed a larger, permanent gathering place and house of worship. Peter Harrison, a Newport resident volunteered to design the synagogue and construction began in 1759. Newport’s Jewish c itizens were closely tied to communities throughout the mid-Atlantic region as well as the Caribbean and garnered significant financial support. Communities in London, Jamaica and Surinam also lent financial support. The building was completed in 1763 and was dedicated on December 2nd, during the Chanukah festival celebrations. The dedication was a regional ceremony attended not only by the congregation, but by clergy and other dignitaries from around the colony. During the American Revolution, the British occupied Newport and many of the Jewish residents fled the city. Isaac Touro kept watch over the synagogue and it became a hospital for the British military as well as a public assembly hall. British troops were desperate during the cold winters and tore down and burned a number of local residences and buildings, however, since the synagogue was used as a hospital and meeting place, it was saved from the same fate. British troops evacuated Newport in October of 1779 and within the next few years many of the Jewish families returned. The war took a toll on the regions economy and rival ports quickly overshadowed Newport. Many of the Jewish merchants had business interest in these other cities, and by the end of the War of 1812, most of the families had moved. The synagogue was used occasionally for holy days and funerals. The congregation decided to lock the doors and left Stephen Gould as caretaker. Legal oversight and its deed were given to Congregation Shearith Isreal of New York, with whom there was already a close relationship. Even with the distance from the synagogue, Newport natives Abraham and Judah Touro both provided aid to maintain the properties. Abraham had a brick wall built around the cemetery in 1820 and bequeathed $10,000 to the State of Rhode Island for the support and maintenance of the “Old Jewish Synagogue” when he died. He also bequeathed $5,000 for the maintenance of the road connecting the cemetery and the synagogue. Because of his generosity, this street was named Touro Street the synagogue took on the name of Touro Synagogue. Judah died in 1854 and had previously replaced the wall his brother had made which had fallen into disrepair. His will included $10,000 towards the ministry and maintenance of the synagogue. 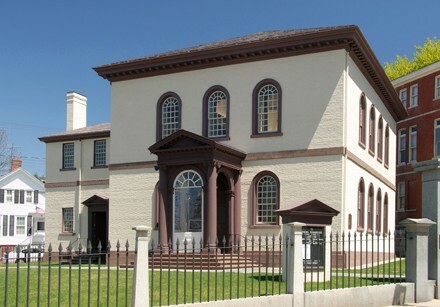 In 1881, the “new” Jewish community of Newport petitioned the New York congregation to reopen the synagogue for services and to appoint a permanent rabbi. Congregation Shearith Isreal in New York complied and sent a rabbi from London, but retained the rights to the building. A lease amount of $1 per year is still paid to the New York group. In 1946, Touro Synagogue was designated as a National Historic Site, followed two years later by the Touro Synagogue Foundation to aid in the maintenance and upkeep of the building and grounds. 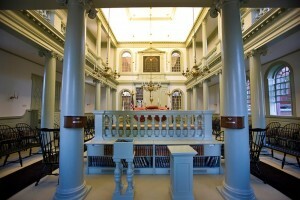 Touro Synagogue remains an active house of worship and is open for tours.